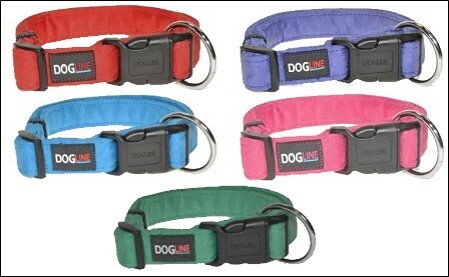 Each Dogline Comfort Microfiber collar is made of durable microfiber material that provides exceptional comfort. This soft yet strong collar made from an ultra suede-like material is fully machine washable and beach friendly. The collar's padded interior provides maximum comfort and super softness. 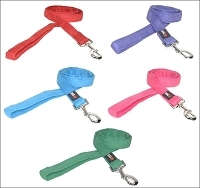 Each collar is reinforced with a nylon band for added strength and security. 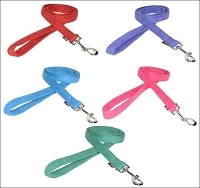 With its two-ply design, super smooth surface, and quick release buckle, your pet will definitely feel special. Small collar fits 9"-13" neck and has a width of 5/8". Currently available in the following colors: red, blue, purple, pink, teal. Dogline Comfort Microfiber Flat Leash - 6' x 3/4"
Dogline Comfort Microfiber Flat Leash - 6' x 1"